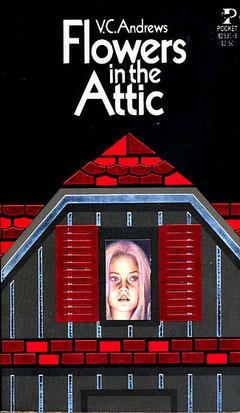 This book is the first in a series in which a 4 siblings are trapped in an attic after their father dies. Their mother reassures them that it will only be for a short while however things don't go to plan and nothing is as it seems. I noticed that this collection of books are based on a true story which fascinated me even more. Immediately I was hooked. There was a very mysterious beginning with lots of unanswered questions and possibilities which kept me intrigued. I felt that the creative use of foreshadowing to hint at events further in the novel worked really well here. The story line was odd and unusual at times but it did a wonderful job of keeping me reading on. There were many twists throughout that I wasn't expecting, as well as a huge revelation at the end which I didn't even guess would be a possibility. There is some incestual relationships that I wasn't expecting to discover but these did add to the mystery. The characters brought a lot to the story. Particularly, I loved seeing the growth and maturity of the older siblings as they stepped up to care for their younger, twin siblings. Also, the author managed to illustrate the changes they experienced as they changed from children to teenagers and the struggles this can come with, such as periods, exploration and love. Overall this was something I enjoyed a lot more than I expected. The blurb didn't entice me too much; it was only the fact that the story revolved around these children growing up abnormally/ trapped in an attic which fascinates me anyway, for instance Anne Frank. It was an odd story and included many twists and turns that are essential for the mystery. Since I am intrigued to read on further by purchasing the next books in the series, I would recommend this book!